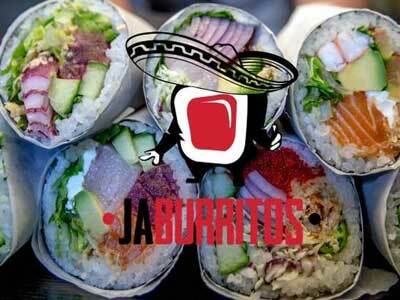 Home of the sushi burrito, JaBurritos combines Japanese and Mexican cuisine in a unique combination. You may choose raw fish or traditional Mexican proteins with many toppings wrapped in either tortillas, seaweed paper or soy paper. Toppings include lettuce, cilantro, cucumber, jalapeno, onion, green pepper, tomato, pico de gallo, roasted corn, cabbage, tortilla strips, cream cheese and guacamole. With 9 different sauces to choose from, you can truly make this customized to your own tastes. The ratio of fish or meat to rice and condiments is just right and you can opt for a bowl versus a roll if you prefer.